Will we be Gymnasts in Heaven? How do those Olympic gymnasts do it? Athletic perfection is a beauty to behold. I marvel at the physical strength, grace, skill and mental toughness of Olympic athletes in general, but in my opinion the gymnasts are the strongest and most skilled of them all. They have my sincere admiration and respect. Maybe you, like me, never had and never will have the strength, skill and focus of an olympic athlete this side of heaven. So, let’s think about the possibilities on the other side of heaven. Contrary to popular opinion, heaven will not be an eternal church service (although the worship there will be so thrilling and satisfying that we might wish it were) or an ethereal bodiless existence in the clouds. Heaven will be the perfect recreation of the earth, the redemption of all that was lost in the Garden of Eden. Can you imagine pursuing your passions, interests, and relationships without the drag and frustration of sin, evil, weakness and fatigue? Even more fantastically, we will know, serve and love our Savior with our “brilliant minds and powerful bodies.” In heaven we won’t compete or work to satisfy ourselves. Our efforts will be for the unlimited and unending glory of God. We might not know it yet, but as we serve and love Him we will find supreme satisfaction ourselves. Don’t miss it! If you don’t yet know Jesus, now is an excellent time to accept his offer of eternal life. How do you envision heaven? What do you imagine doing with your “brilliant mind and powerful body?” Do you think we’ll be gymnasts in heaven (if we want to be?) I figure we’ll have all of eternity to practice! Note: I first heard these quotes in a sermon series called The Inside Story by Colin Smith. If you are interested in learning more about heaven, check out the sermons on Heaven and The Resurrection. Another excellent resource is the book Heaven by Randy Alcorn. Gallery | This entry was posted in Current Events, Eternal Life, Heaven, Redemption and tagged Athletes, Eternal Life, Gymnastics, Heaven, Jesus, Olympics, Perfection, Resurrection. Bookmark the permalink. 15 Responses to Will we be Gymnasts in Heaven? Wow, what beautiful and encouraging thoughts. Loved this post. Thank you for stopping by my blog. I as so happy to have found yours. Blessings to you. Hi, Judy. Heaven…a place to celebrate Christ’s victory and live fully as the children of God we were created to be. Thank you for this post–what a beautiful reminder of the hope we have in Him. I love the Olympic Games. In most instances, I believe that the Olympics represent the world at its best…and isn’t that what God desires…the world coming together and cheering one another on in our individual and team/country endeavors. The purpose of each and every event is not found in winning and losing but, rather, in taking part – in fully participating in the life that God has given to us. Yes, I believe that eternal life is something that is both “not yet” and “now”. We can experience God’s glory and presence in one another when we set aside our personal ambitions and simply revel in one another’s accomplishes and cry with one another in our sufferings. The Olympic Games – 16 days of heaven on earth…if we allow it to be! 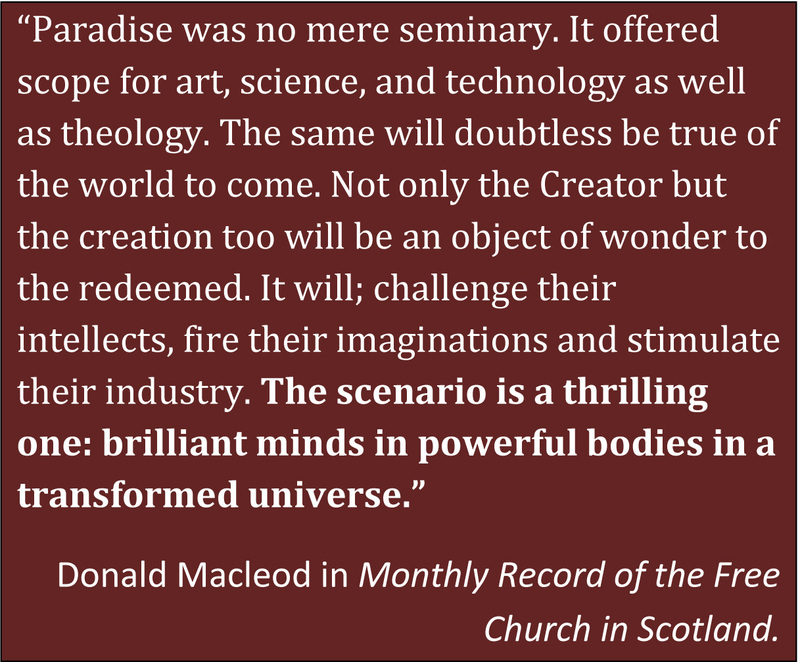 I guess I need more context for Macleod’s statement that, essentially we’ll have bionic, 6 million dollar bodies because, “we’re going to need it (them) more”. 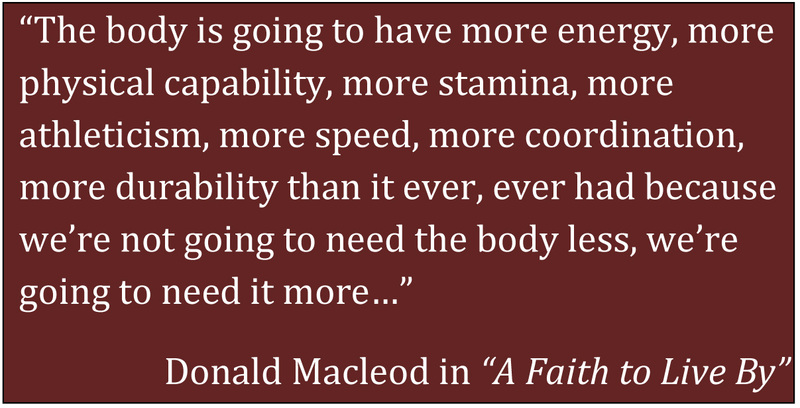 I’m missing something of significance, maybe–Even though we’re not just going to sit in a church pew throughout eternity, what are we doing that will require phenomenal energy, stamina, coordination, etc? Maybe I’m over-thinking this? I imagine us doing what we were created to do, but with more energy, opportunity and success than we are capable of now. It’s my understanding that heaven will be a place of satisfying work and cultural pursuits. Maybe I get carried away, but I think of heaven as endless opportunity to learn, work, explore, and develop new skills. The one thing I am sure of is that it will be beyond our wildest dreams! Sounds really good, Judy! Thank you so much for your response–I was having a hard day, and hoped I didn’t sound petulant; it was taking all my limited brain power to read comprehensively! God bless you Big. I perceived no petulance at all:) Blessings to you Caddo! My daugthers are gymnists… I wont be one till I get to heaven! LOL. Then I can do all kinds of filps with them. This is a post from Judy’s blog that sparked my imagination. I can imagine myself doing backflips with Jesse in our glorified resurrection bodies. This post is near to my heart. I can’t wait to do backflips with my son, Jesse, in Heaven. With your permission, I would like to reblog this post on my site. I’d be honored, Peter. And I look forward to applauding you and Jesse as you backflip together! I agree love is the only ticket that will get us entry into the final game. If forgiveness is the exchange for love then love will asure that we are able to pull off a one and a half with a full twisting dismount and stick the landing into heaven and into our Father’s Presence. Great post as usual Judy. No deductions on this one. Thanks. “…stick the landing in heaven and into our Father’s presence.” What a great comment! Thanks!